Several of them are about different card folds and they are all easy to create for yourself. Many people are getting switched onto these dies and the beautiful results that can be obtained from them. But many people don't know where to start when they want to buy some. There are so many to choose from that it can get confusing to know which to buy and the main stumbling block is the cost. They are not cheap and there are new dies coming on to the market all the time, which adds even more to the confusion. So through building up my own collection and working with these dies over two years or so I have grown to love them even more. It is almost impossible to make a bad card with these dies as all the difficult cutting is done for you. But which do you choose? Which set goes with which? well the answer to that question is any die goes with any other die... as they all intermingle with each other. So I thought that maybe you would find it useful to have a little bit of help in deciding which of them to get so that they will give you the results you want. 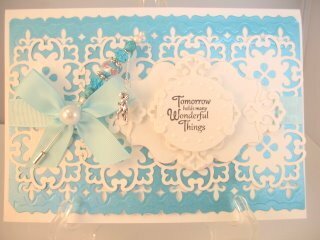 A collection that would give you something for every area on the card from the background to the topper ... and all the bits in between. Starting Your Spellbinder Collection covers the backgrounds, the edges, the toppers, the flowers and the leaves. The indivdual sets are explained in the video and I have chosen one from each set. And from the comments and emails I have had it seems that a lot of you have found it useful. It puts the same set of basic dies to good use and shows you how to get a different look for your money. 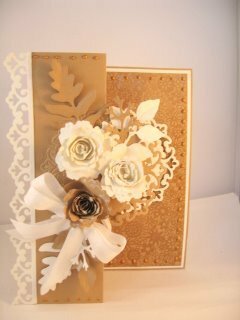 Then I went on to create this really Special card still using the same dies. It doesn't matter if you have different dies you will still be able to create the most beautiful effects on your cards. But by building up the starter set you will save yourself time, money, confusion and worry and you will be able to get started straight away. 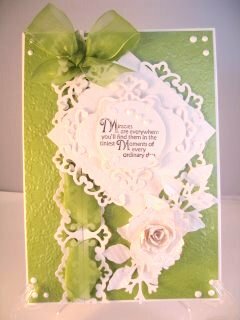 This gorgeous card is very easy to do and with the addition of the flowers it would look fantastic in any colour combination. So all these cards are made from the same sets just in different combinations. But if you don't have the Grand Calibur then use the one you have with the dies and create the texture in your background with the Masks I told you about last month. This month I have started a new adventure into Blogland. Flowers, Ribbons and Pearls and I will be adding to it regularly. So please pop across and take a look and maybe you would like to become a follower too. Leave me your comments on anything that you see. So all that is left to say is thank you so much for all your support and I hope you will continue to visit the website, and now the new Blog in the future.